Purchased from ebay flipper who purchased from brother of old Aerospace Engineer. In good repair and well maintained. If anybody can place the year from sn let me know. The Owner painted it Delta grey and also painted the grips red. The red has been cleaned off. I'm leaving the grey as it looks better than the orig wrinkle grey you often see in old 1940s slide projectors. I will get more pictures later. Anybody know the value ? Love it. Just what I need over China General 8 " junk. The base has a welded up crack approaching the rear support hole but the weld is thick and a good job but not ground down. The front pulley is not in good shape having a slight wobble and when combined with 1/2 inch A cut 36 inch belt transfers the wobble to shake thus inducing stress on the neck. I replaced the old speed queen belt with a 3/8 width which reduced the translation of vibration due to a smaller width. It was set on low speed and wood dust was on the unit and Orig bolted to wood table. The belt still oscillates but to a lesser degree not being A cut. Works well for what I want just drilling for small metal. Runout is in good working order compared to new China press. China press you can shake the chuck play with your hand and much vibration and noise rattling. I mounted a switch on the left lower motor mount welding some flat galvanized metal to the back of an electrical box. I used the existing motor mount hole without doing any drilling. I would like to find a more precise machined flat belt with less thickness avoiding channel stress. 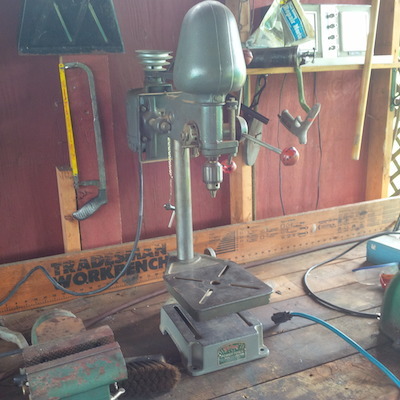 The owner had multiple drill presses so this seen little use except for work. Orig setup had the motor tilted inward and the 2 pulleys not in alignment.